The Old Town Canoe Company of Old Town, Maine was formed in 1901 as the Indian Old Town Canoe Company. After a short stint as the Robertson Old Town Canoe Company, with J.R. Robertson as partner, it became the Old Town Canoe Company. 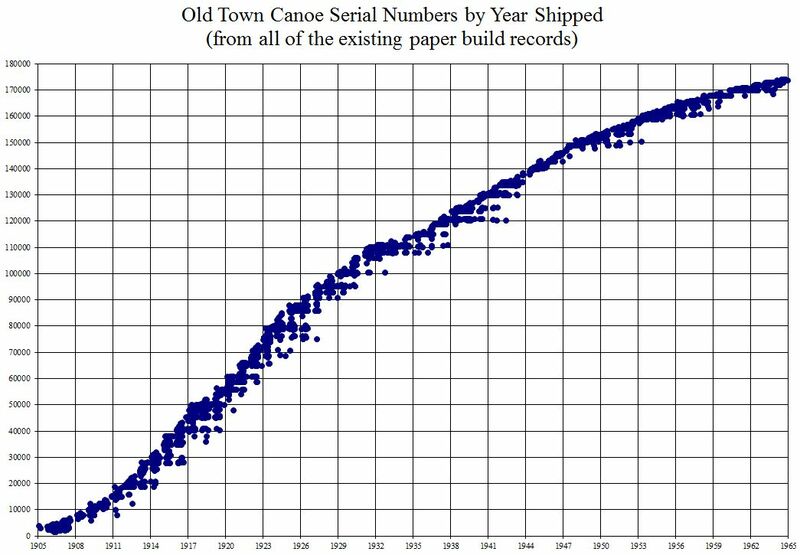 Still in business today, Old Town has built well over 200,000 wood canoes over the last hundred plus years. Old Town marked their canoes with a simple sequential serial number scheme. Canoes will be found marked on the inboard upper face of the stem. The serial number is four, five or six digits, a space, and then the length of the canoe. Records survive for Old Town canoes dating back to 1905. Build records for individual canoes can be obtained by posting the serial number to the Serial Number Search section of the WCHA Forums. Charles River (1902-1929): Originally called the Robertson Model, it may have been designed or brought to Old Town Canoe Company by J.R. Robertson during his short tenure as a partner in the business. 50 Pound Model (1910 – circa 2010): Lightweight model with thinner ribs and planking than typical. Variations of this model were called the Trapper, Lightweight and Featherweight. H.W. Model (1901-1953): No one knows for sure what the “H.W.” stands for, but most likely it stands for “Heavy Water,” a descriptor used in Old Town’s catalogs to promote the models seaworthiness. Ideal Model (1906-1929): Same as the Charles River model, but with the newly introduced open gunwales and half ribs. Livery Model (1913-1919): Old Town’s most stable offering, it was renamed the Yankee for 1920. Molitor (1965-present): The Molitor model was built using the Otca form, but with extended “torpedo” stems and heavier gunwales that produced a canoe that does not require thwarts. The Molitor deck is a distinctive 4-lobed design. There was an earlier uncatalogued model with the same name based on specifications by Belle Isle livery owner C.J. Molitor. Otca Model (1908-present): The name “Otca” comes from Old Town Canoe Company’s telegraph code. The Otca has a distinctive 20″ long deck with a coaming. In 1957, the 16′ Yankee model was substituted for the 16′ Otca, and the standard deck became the norm. Yankee Model (1920-1956): Originally called the Livery Model, the Yankee name was adopted in 1920. In 1957 the Yankee became the 16′ Otca and the original 16′ Otca forms retired. The Complete Old Town Canoe Company Catalog Collection - a digital collection of Old Town catalogs is available from the WCHA Online Store. 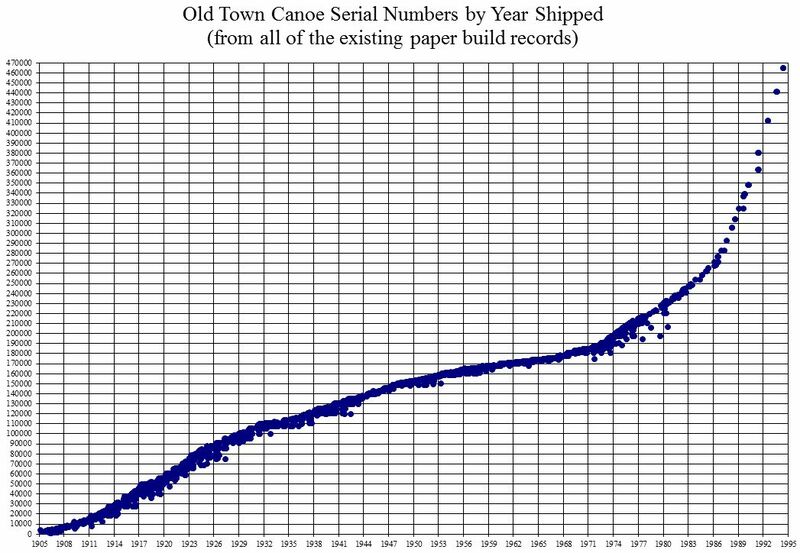 Old Town Canoe Company Build Records, consisting of over 200,000 records is available from the WCHA Online Store in digitial format.